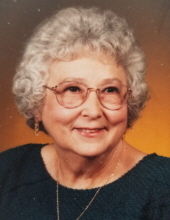 Highland, IN – Alma M. Jones age 90, of Highland, passed early Friday morning, January 25, 2019. She is survived by her loving children, Michael (Kate) Jones of Munster, Terry Jones of Highland, 4 grand-children and 7 great grandchildren. She is preceded in death by her husband Marion Jones. Alma and Marion came to northwest Indiana in the 1950s where they settled, worked hard and raised a family. Alma loved her family and she loved to quilt (by hand, no machines). She left many cherished examples of her art behind for her family to cherish. A celebration of her life will be held on Wednesday, January 30, 2019 from 9:30 - 11:30 a.m. at the Immanuel United Church of Christ, 2201 Azalea Dr., Highland, IN with Reverend Merlyn Lawrence as Officiant. In lieu of flowers, donations to the Immanuel United Church of Christ would be appreciated. To send flowers or a remembrance gift to the family of Alma Marie Jones, please visit our Tribute Store. "Email Address" would like to share the life celebration of Alma Marie Jones. Click on the "link" to go to share a favorite memory or leave a condolence message for the family.